I think many travelers can relate to the experience of seeing images of a particular place, landmark, or monument, and upon arrival it’s just not quite the same as the photos. From what I had heard, Taranaki could be one of those places. The stratovolcano after which the region is named is stunning on a good day, but unfortunately it's located in a country that's known for showing the full range of four seasons in one day. (Seriously, Crowded House wrote a whole song about it, look it up.) So it's not that Taranaki was unimpressive in person, it was just inconsistently impressive due to inclement weather. New Zealand weather is hit and miss, sometimes it hits you at the wrong time, but sometimes it misses you and you catch something truly spectacular. One morning on my way to work in Nelson I heard local radio show hosts talking about a Canadian couple that they had met in Taranaki on a particularly rainy weekend; the woman had flown all the way from Canada to visit her boyfriend who was living on the North Island, they hung out in Taranaki for three days hoping to get the famed view of the snow-capped Mount Taranaki. It rained everyday. At the end of the long weekend they left, but still planned to come all the way back at the end of their trip to try to catch a glimpse. 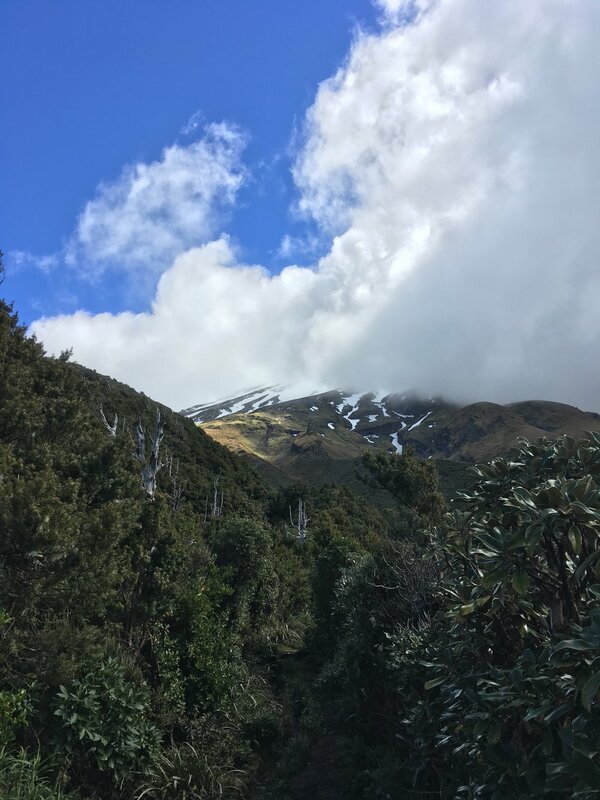 The hosts scoffed a bit and wondered whether it was really impressive enough to warrant another trip out there, after all, Taranaki isn't exactly "on-the-way" to anywhere, it's on its own little circular peninsula with the volcano smack in the middle. You only end up in Taranaki if you meant to end up in Taranaki. Bearing all this in mind, I still planned a stop there on the Carlindsay road trip because it was somewhere that I had wanted to go when I first started researching a year ago…what can I say, Instagram is a pretty good publicist. After an early start westward out of Taupo and a couple of stops along the coast, Lindsay and I arrived to Egmont National Park around midday. As we neared the mountain the road grew narrower and windier, with trees and bush growing right up to the edge of the road. The summit was completely covered by clouds that seemed to be in constant motion and endless supply. I was hopeful though, because in the span of fifteen minutes driving on this road we had seen overcast skies, then sunshowers, followed by clear blue for a few moments before returning back to full cloud cover. Basically, any and all weather was on the table, so a clear shot of the mountain was at least within the realm of possibility. Since we had run seventeen kilometers the previous day in Taupo, neither of us felt the need to hike for any extended period of time, but we did want to have a walk in the national park (or, more accurately, I did, and I dragged Lindsay along with me.) At the Visitor Center we checked out the map and found a 45-minute nature walk that looked like it might do the trick. So we laced up our boots, packed a raincoat, and hit the trail. After climbing a fair amount of steps, we got to a sign that read “Lookout” with an arrow, and decided we could just find the lookout and turn around. I figured it couldn’t be far since there was no indication of distance on the sign. Well, the result was an hour-and-a-half long walk where we stopped every few minutes at the next break in the growth and asked in exasperation, “Is this the lookout?” It was truly hard to tell, because the views over New Plymouth and straight out to the ocean were incredible, literally any point could have been classified as a "lookout," but that didn't make it any easier on our tired legs. Friends, if you’ve never run ten miles on one day and then tried to ascend and descend uneven stairs on the side of a mountain on the very next day, I’ll let you in on a little secret: it’s really not that fun. We looked like elderly women hobbling around, wincing at every step, and wondering out loud when we were ever going to turn a corner that didn’t reveal more stairs in store for us. Eventually the torture ended and we made it back to the car park with our jello-legs. On our way out of the park we kept looking back to see if maybe, just maybe, the clouds that had been rolling in and out all afternoon might finally roll all the way out to sea, but no such luck. 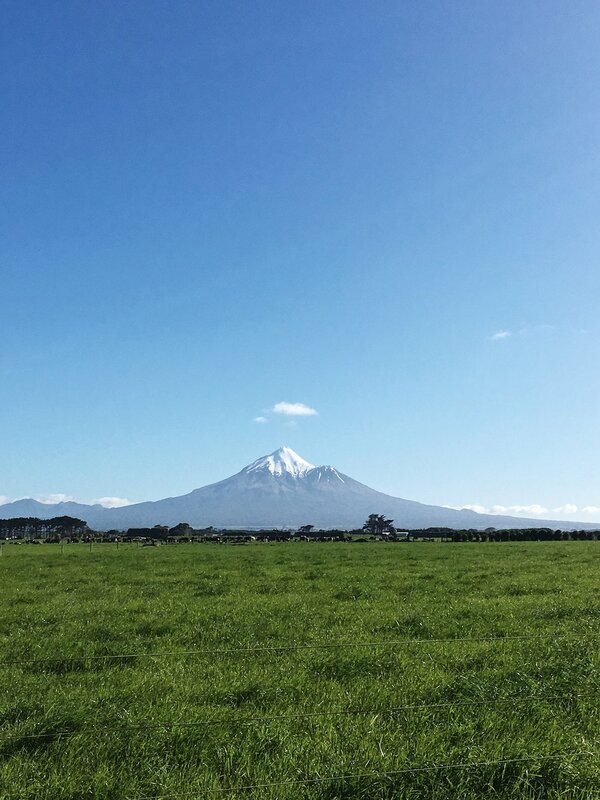 Fortunately for us, even though Mount Taranaki is the more famous, and certainly more visible, distinguishing landmark in the region, it is not the only feature that Taranaki could brag about. The beaches are also really dank. 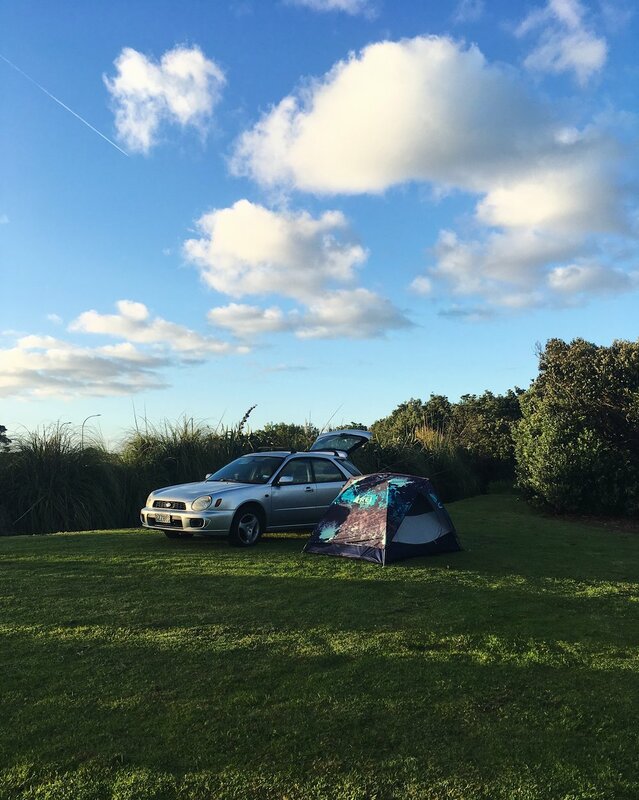 We used CamperMate to find another place to freedom camp on the coast west of the mountain in a town called Opunake. When we rolled up to the spot we only saw one RV that looked like it may have been there for weeks (and probably wasn’t going anywhere soon) the rest of the site was just lush green grass that looked like it was transplanted straight from a golf course. We actually had to double-check CamperMate to make sure we were in the right place, since it was so shockingly opposite to the freedom camping experience we had the previous night in Taupo. After parking Beezy in a corner that would be sheltered by the brush if the wind kicked up from the sea, we set out completing the normal meal-making rituals of car camping. Fire up the JetBoil, toss on a pot of the New Zealand equivalent of Rice-a-Roni with some red pepper and green beans, and you’ve got yourself a camp dinner of champions. The shadows had been slowly lengthening across the grass as we ate, so we decided to take our after-dinner beers down the stairs to the beach to soak up the final rays of sun. The campsite was situated on a small cliff, and below was another black sand beach that the west coast of the North Island does so well. It was a Sunday evening so the beach was pretty deserted, save for a lady walking her dog. It was a simple moment, just sitting there on the rocks that had been warmed during the day by the sun that was now slowly lowering itself into the Tasman Sea, burning a brighter, deeper orange with every minute. It always seems to me that these smaller, unassuming, and simple moments are the ones that become the most memorable, even within a trip where you're constantly exposed to the most stunning of natural marvels. 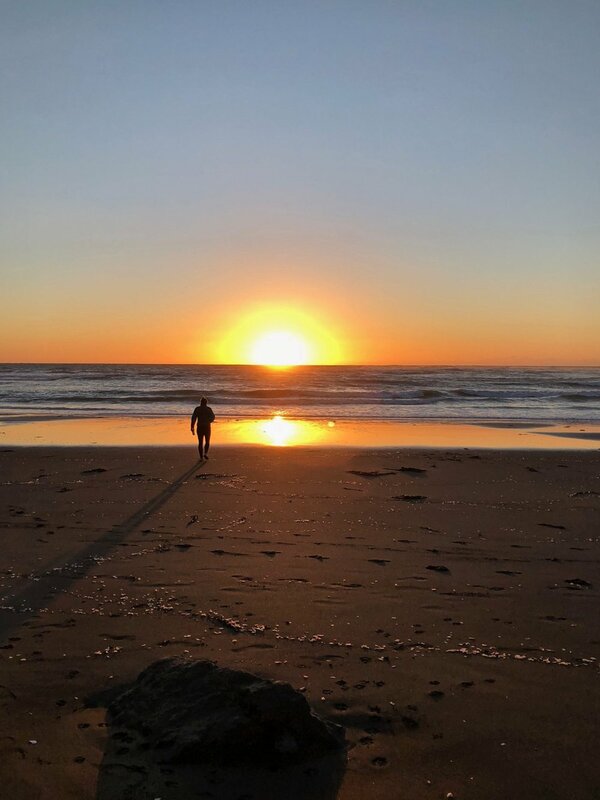 They are the moments where you’re sitting on a relatively unknown beach, cold beer in hand and good friend at your side, quietly watching the sunset, and you turn to your friend and say, “I don’t think it really gets better than this." (If I had a nickel for the every time I asked, “Does it get better than this?” this year I’d probably have enough money to finance another year abroad.) 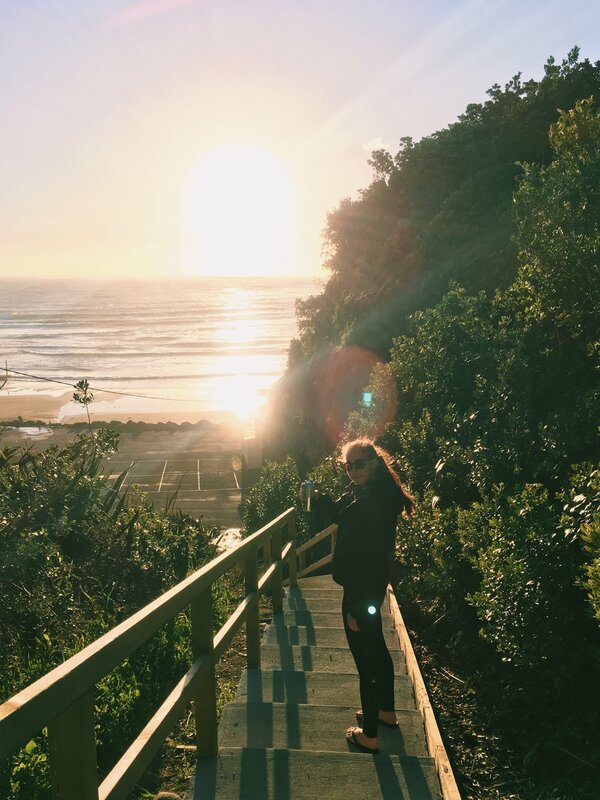 So yeah, maybe we didn't catch the perfect Instagram shot of Taranaki, but I'd take that moment over a lame photo any day. As fate would have it though, the first thing we saw when we unzipped the tent door the next morning was the snow-capped summit peeking out from above the trees across the street, not a cloud in sight. Lucky for us the clear skies lasted all morning, and we got that view for the whole drive out of the region down country lanes through fields of dairy cattle. Hoping the blue skies and sunshine would last a few hours south, we were onto the last stop of our whirlwind North Island tour, windy Wellington.